Can you identify the individual in this photograph? 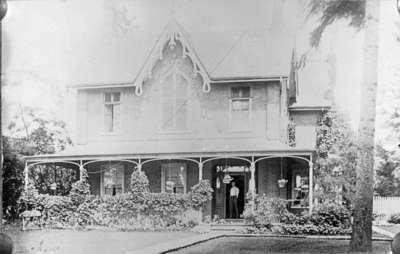 A black and white print of the residence of W.D. Dykes with an individual standing outside on the porch. This brick house was built about 1857 on the north side of Dundas Street west of the Dundas Street School grounds (at 552 Dundas Street East). It was demolished in 1977. Residence of W.D. Dykes, c.1920, Photographer Unknown. Whitby Archives 17-034-001.